Hi. You are on the site about Uzhhorod (Ungvár), a town in Transcarpathia county (Zakarpattja) in western Ukraine, a country which has borders with Poland, Slovakia, Hungary and Romania on its western edge and on the eastern edge of Europe. Here you can find images from my collection of old postcards (1893 — 1950). Besides cards, on the Others page you can find some interesting stuff, such as the Uzhhorod emblem, old maps, and stamps. And if you need more general or historical information about the town, you can follow the Links to other sites. It's a pity that I don't speak English well enough to write correct comments, so many thanks to Olexandra Andryshyna, who was so kind and offered to help correct any grammatical mistakes. I'd be glad to hear your opinions, corrections, or suggestions about the site's organisation. 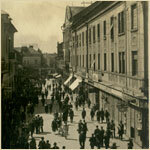 Feel free to drop me a message, if you collect old images of Uzhgorod, or if you simply like or dislike the site. Don't think that this site can ever be finished. It is constantly being updated, so come back soon.